Kick-start any size of IT projects with automated guide-through process, with step-by-step instruction, input references and samples. 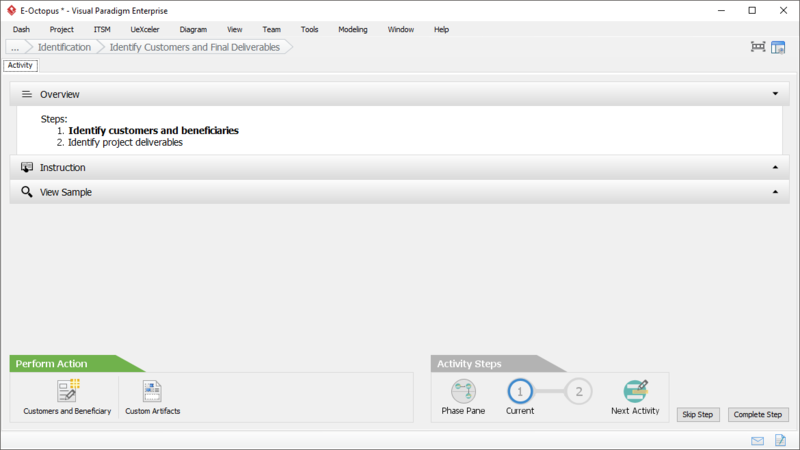 Develop deliverables incrementally and collaboratively with your team members. 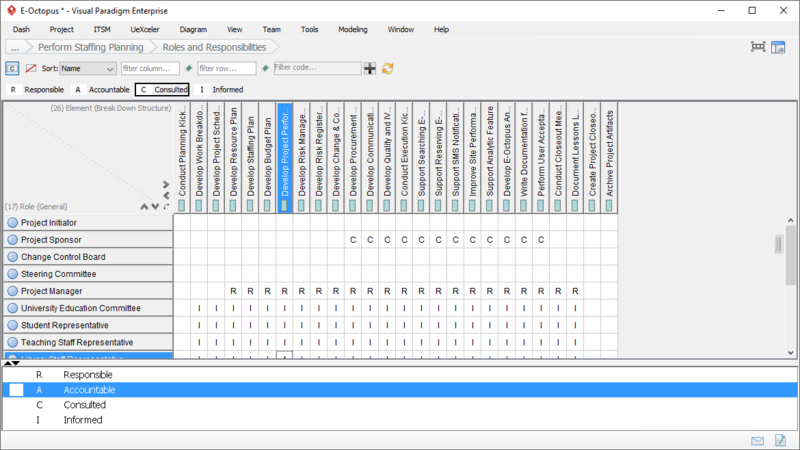 Enhance and streamline the entire process with automated task management and notifications with task manager in the desktop and/or over the cloud environment. The Project Management Lifecycle. There are five phases in total. Each of the project phase consists of a set of activities. These are the activities involved in the Identification phase. Each activity consists of a set of steps required to perform. There are instructions that teach you how to complete the steps. Some activities require you to fill-in forms in order to produce deliverable. 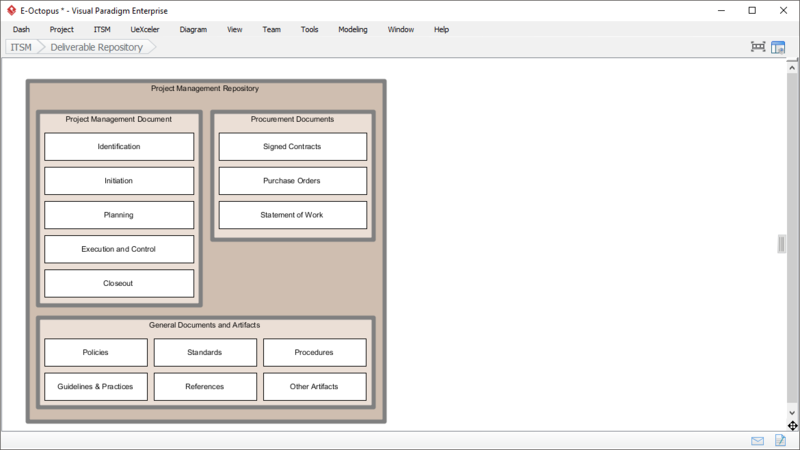 This screen shows the entering of customer details, in Project Charter. Some activities require you to draw diagrams. 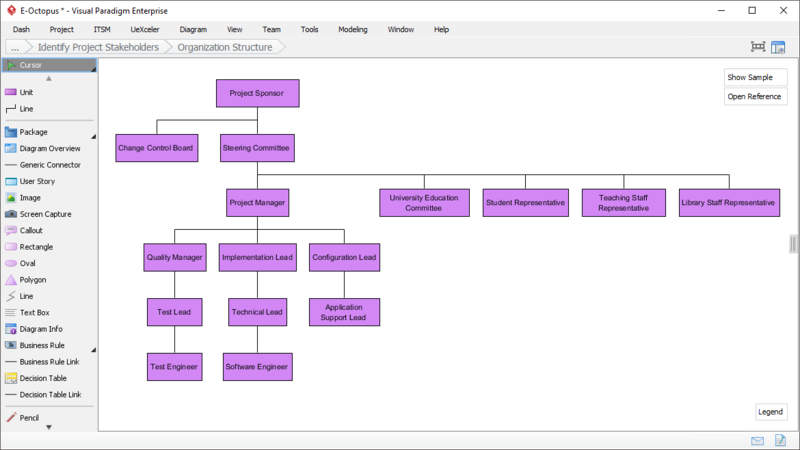 Like this one, it requires drawing an organization chart to representing the organization's reporting structure. 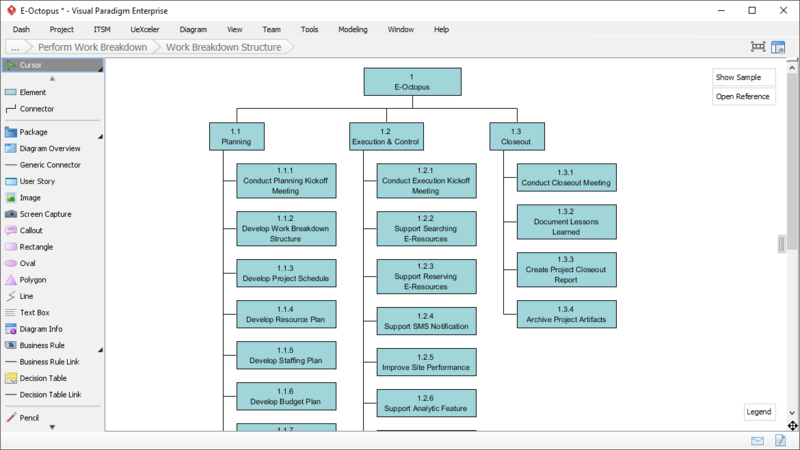 Draw an Enhanced PERT Chart to represent the project schedule and the inter-dependencies of tasks. 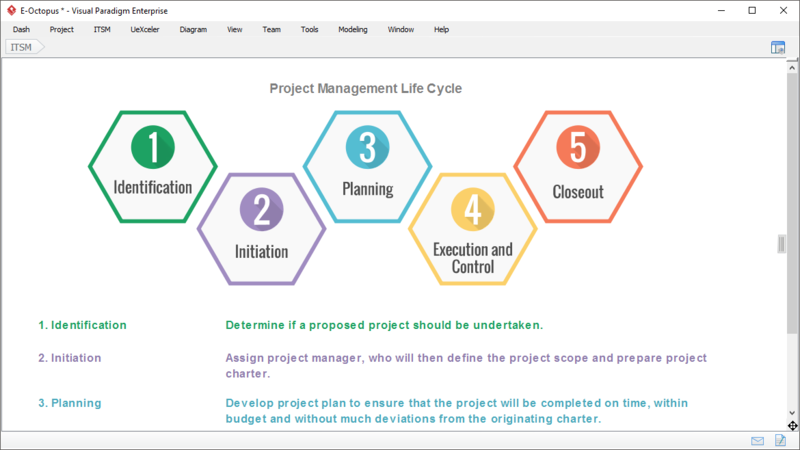 Use an RACI chart to represent the responsibilities of different project stakeholders. 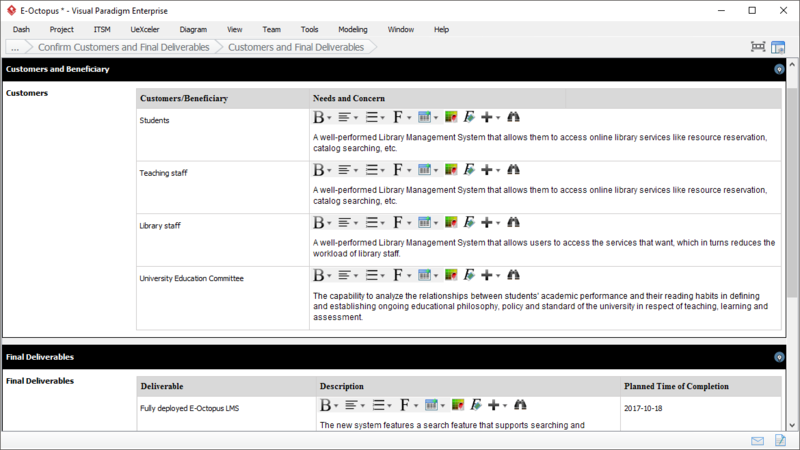 Project Management Repository is where deliverables being archived. While deliverables are automatically archived, you can also put a file into a drawer (in the Architecture Repository) manually. Hard to get project started and well managed. It involves a lots of upfront investment, trainings and additional resources. Staff do not have the confident or enough maturity to properly kick start business project initiatives. The deliverables of the IT projects didn't align with business goal and objectives. As a result, the proliferation of many different but isolated and ad-hoc initiatives are developed randomly without following any guidelines, standards or procedures. One-size-fit-all solution, process, tool or software is often not efficient for dealing with different sizes or complexities of projects. 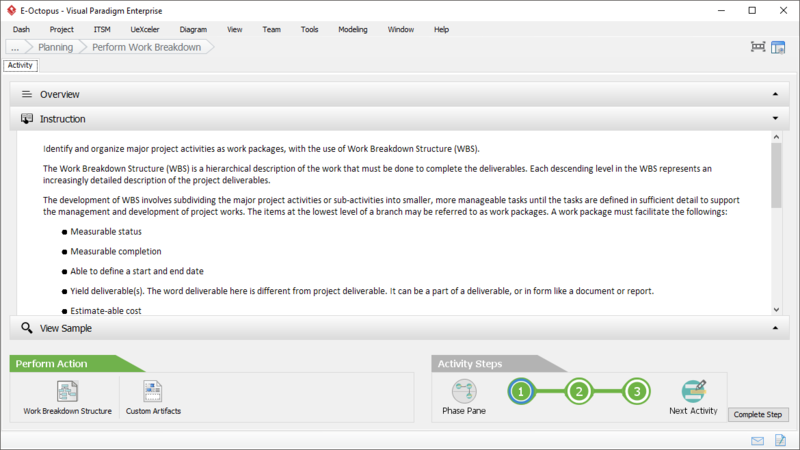 Visual Paradigm's s unique Guide-Through Process provides all the instructions, samples, steps, input references for performing analysis, and incrementally developing, classifying and achieving deliverables automatically in a documentation repository. 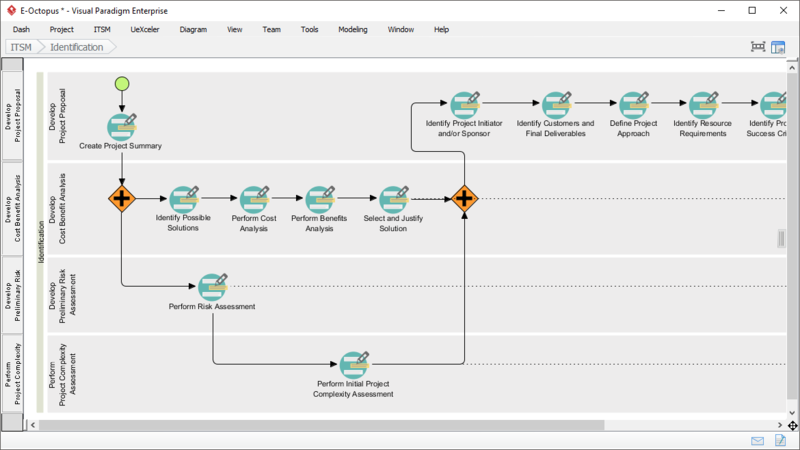 The Guide-Through Process provides step-by-step path for you to navigate back and forth within each development phase and to traverse around different phases using the process navigator. The progress indicator let you know exactly where you are and what need to be done in the next steps. 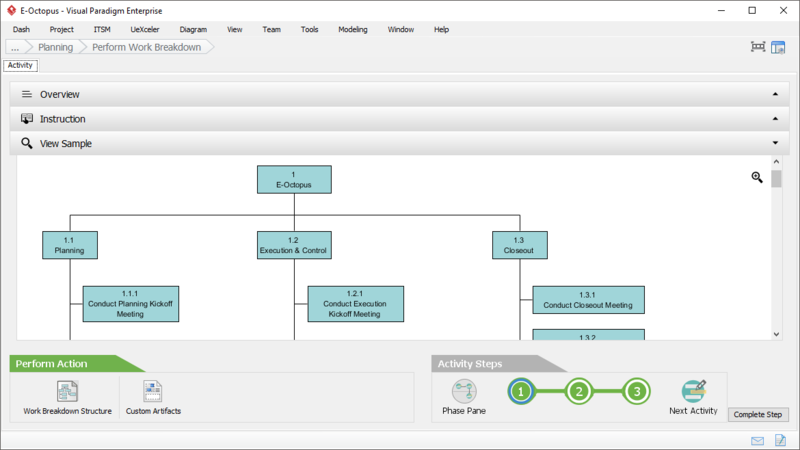 Follow the well tested project management process (compatible with PMBOK®, PRINCE and ITIL) with easy visual modeling language support, enables stakeholders from different domains (project owner, business analyst, enterprise architect and IT professionals) to collaborate easily and effectively. Follow the auto guide-through process, all the information filled, diagrams drawn and analysis performed will be summarized into nicely formatted deliverables. 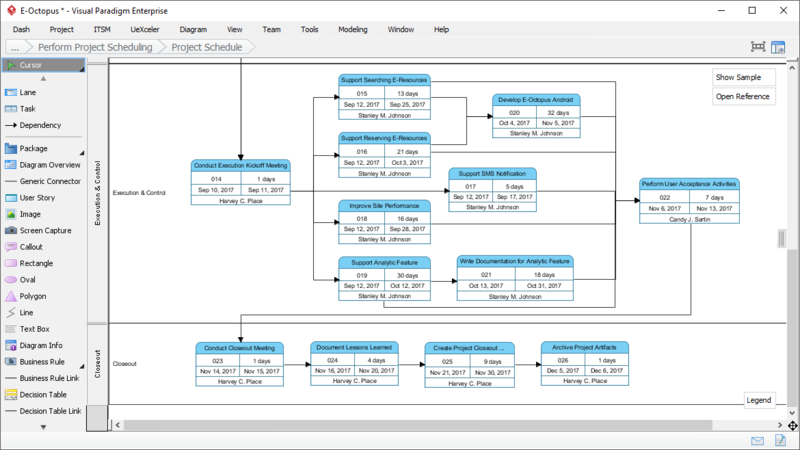 Project Management Guide-Through include an "Identification" phase to determine a project's complexity for adopting the most suitable process scheme.